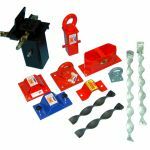 With a huge range of heavy duty, high security chains to choose from it`s important to make the right choice for your needs. Not all chains are good for security applications. For example, a boat or ship mooring chain has different properties, specifically appropriate for this purpose. 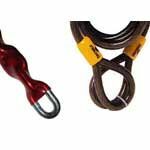 A mooring chain will have high tensile strength along with ductility and elasticity, necessary when securing a vessel at anchor. Whereas a high security chain must protect against sawing, bolt cutters and freezing - which are all used when security chains are attacked. To help you make the right choice we have provided a useful guide: Choosing a Security Chain. Thickness of the chain link cross section. The thicker the metal then the harder it is to cut through it. Welded links. Unwelded chain links can potentially be prised apart. Welded links are therefore more secure. Case hardened links. This process hardens the surface of the metal chain links making it difficult to saw through them. Through hardened links. This process makes all of the metal in the chain links harder. This makes chains much more resistant to attack using bolt croppers. The very best security chains use steel which provides an optimal balance between hardness and flexibility in order to resist bolt cropper, sawing and freezing attacks. Before choosing your security chain it`s worth clarifying exactly what it`s to be used for and the value of the property that is to be secured. It has been suggested that a good `rule of thumb` when budgeting for security is to allocate arouhnd 10% of the asset value to be spent on security measures. So, for example, if you are looking for a bicycle security chain to lock up your £2000 bike, then spending around £200 on a good chain, lock and other bicycle security measures would be a sensible budget. Similarly, if you are considering a heavy duty motorbike security chain to secure your £10000 motorcycle then spending £1000 on security should give you some peace of mind. It is always recommended that you should use the highest level of security possible. We offer a comprehensive range of professionally selected Security Chains, manufactured from special steel alloys. These have case-hardened and/or through-hardened welded steel links and include our range of Superlink chains. PVC or cloth sheathed or unsheathed options are available together with a choice of link sizes and security levels. All chains in our range feature welded steel links. The extensive range of carefully selected security chains from Insight Security offer an excellent level of security, complemented by our range of heavy duty ground anchors, padlocks, hasps, etc. Heavy duty chains are commonly used to secure high value assets such as motorbikes, boats, caravans and property. In these scenarios it`s important to present both a clear deterrent as well as a robust barrier which is difficult for an attacker to quickly and easily overcome. Our high security chains have a minimum of 11.5mm diameter links and are designed to meet or exceed Sold Secure test standards. The special steel alloy welded-links are case-hardened to resist sawing attack and deep through-hardened to resist bolt cropper attack. These heavy duty chains are used by prestige organisations including: MOD, Utility Companies, Local Authorities, security services and many other organisations that have stringent security requirements. Our general purpose medium to high security chains feature case and through-hardened welded steel link models and represent excellent value for money. They offer a higher level of security than products generally available from popular retail outlets yet are very competitively priced. Often you will want to accompany your security chain with an appropriate padlock, without compromising overall security. After all, there is not much point in using a heavy duty chain with a weak padlock. Our chain and padlock bundles have been put together and tested by the security experts here at Insight Security. They are designed to save you money, save you the headache of finding the right chain and padlock pair and provide excellent, cost-effective security. 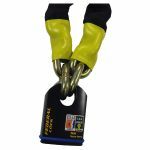 Here are just a handful of links to our best high security chains, padlocks and anchors. What is Sold Secure Gold? Sold secure is an independent organisation, established in 1992 by Northumbria and Essex Police, that assesses the quality of security products. They use standardised tools and testing methods to enable consumers to accurately compare the attributes of security products. Locks and chains are broadly categorised as bronze, silver and gold based on the amount of time it takes an attacker to breach the security. Sold secure gold means that a lock or chain offers the highest level of security. Sold secure silver offers a compromise between cost and security. Sold secure bronze offers protection against opportunistic thieves. Sold Secure approved chains are rigorously tested against sawing, cropping and freezing attack among other tests.